We are excited to announce some amazing new offerings for Disney Cruise Line in 2020! New ports and destinations await, as well as a return of one of our absolute favorite Disney Cruise sailings in the entire world! After a five-year hiatus, the Disney Magic will return to Greece in summer 2020 as part of three special Mediterranean voyages departing from Rome.You can marvel at the beautiful landscapes and archeological wonders of destinations like Piraeus, the gateway to Athens; Katakolon, near ancient Olympia; and the islands of Santorini, Mykonos and Crete. Additional new ports of call in Europe include Gdynia, Poland; Nordfjordeid, Norway; Plymouth, England; and Zeebrugge, Belgium. This new collection of destinations is part of the Disney Magic’s grand tour of Europe in the summer of 2020. In addition to seven-night eastern and western Caribbean cruises from Port Canaveral, near Orlando, Florida, the Disney Fantasy will embark on a variety of itineraries to the Caribbean and Bahamas. These include five- and nine-night Caribbean sailings, along with three-, four- and five-night Bahamian cruises, three of which feature two stops at Disney’s private island, Castaway Cay. Three Cruise Ships in Florida! Early 2020 will see three Disney Cruise ships departing from Miami and Port Canaveral. Sailing both the Caribbean and Bahamas, each ship will include a stop at Castaway Cay. This year they are returning to stops in Puerto Rico for a limited time with select southern Caribbean sailings. Then the Disney Wonder is heading off to San Diego for Baha and Mexican Rivera Cruz routes. Disney Cruise Line is returning to Hawaii for two special sailings! With special stops to the islands including the beaches of Waikiki on Oahu, views on top of Haleakala on Maui, the gardens and waterfalls of Kawaii, and the natural wonders of the big island. For the first time – sailing out of New Orleans! 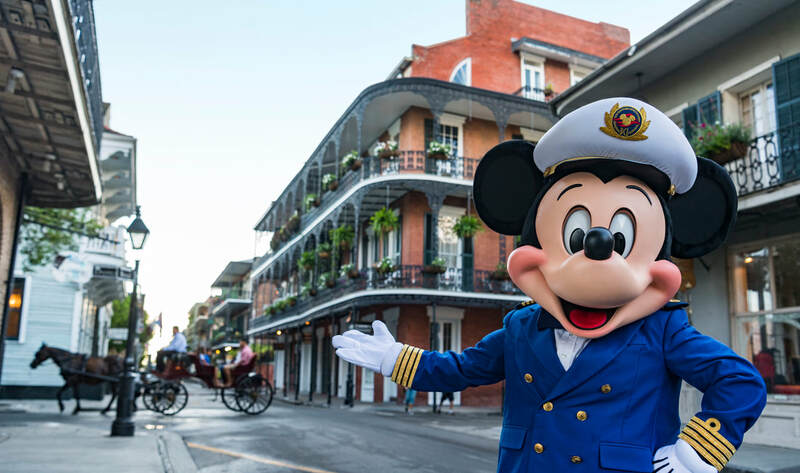 Disney Cruise Line is sailing from New Orleans for the first time! Starting in early February 2020, Disney Wonder will be offering Caribbean and Bahamian cruises from the Big Easy. Add a visit to New Orleans before or after your cruise for the full New Orleans experience. Contact our team today to help book your early Disney Cruise! Prices only go up as the boat fills up!